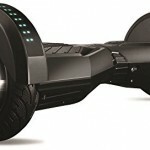 Razor Hovertrax hoverboard review - #1 Kids hoverboard 2018? We would recommend the Razor Hovertrax to anyone looking for a reliable and safe hoverboard. A well established and known manufacturer of similar products with great customer support. It has a 10 mph top speed with a detachable battery-pack so that you'd be left with ZERO downtime. A great design and well thought thru hoverboard. The first hoverboard model from Razor didn’t come out the way they’ve hoped and even though it was a good ride it did lack some features and also the speed and distance was just mediocre. 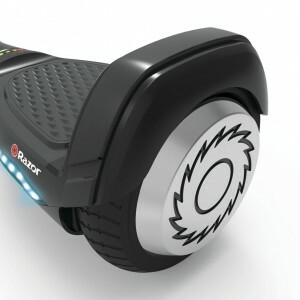 But this new upgraded 2.0 hovertrax will surely make the guys over at Swagtron sweat for a bit. It will compete, toe to toe with their most popular model the T1. They’ve sorted that out and we can happily give you our extensive review of the Hovertrax hoverboard from Razor. In our hoverboard test, we quickly discovered that Razor really did go through every single detail before launching the 2.0 model of their self-balancing scooter. Just by opening the package you get wowed by the detailed design and futuristic look of it. The first thing you’ll see is that this one has a level indicator instead of that old battery led light which didn’t do any good at all. I remember asking myself why this wasn’t implemented from the start, well no need for us to be asking that question anymore. You’ll easily know how much juice you’ve got left and when it’s time to head home. But wait, you don’t even have to do that. You can just easily rip out that exchangeable battery pack from your backpack and exchange it right there on the spot and you will be able to go even further without having to stop and charge. Or you can just keep one plugged into the charger, go home and swap it out and you’re up and running in no time. For starters, Razor is a well-known and trusted brand which distributes products worldwide which mean that they know what they’re doing and they always stand by their product and quality. It’s been tested by UL and gotten its certificate for being one of the safest hoverboards available and there’s nothing to argue about there. It’s reliable and if you’ve seen the way UL tests these hoverboards you’d know that if it passes it’s robust and quality made. Another thing that really sticks out is the ever balance technology the Hovertrax 2.0 has. Well, what does ever balance technology do? -It does just that, it will keep itself balanced even if you’re not mounted upon it. Something that makes it much easier to transition on and off the hoverboard and minimize the risk of damaging the well-designed piece of artwork for a hoverboard you’ve just purchased. Also, it also minimizes the risks of you falling off also. Final words are that this is a hoverboard will fit both adults and kids and it is easy to use and master. Of course, by now we’re experienced but we had no problem riding it and you can always be sure not to be left in the dark if you would ever run into trouble along the way. We actually gave them a call asking for assistance just to see how well they know their product, no problem. With that said we recommend the Hovertrax as one of the best hoverboards for kids. Reliable, great distance with its exchangeable battery packs, good speed and awesome quality and driving experience makes this one a great bang for your buck. Beneath you can read about the first model from razor which wasn’t as good as it could have been. But they’ve learned their lesson quite fast and we will definitely see more from Razor hoverboards to review in the near future. Hovertrax is UL 2272 certified, ensuring it meets or exceeds the industry's highest electrical safety standards. Safety, Razor as a worldwide brand with its qualities inflicts a certain safe and secure feeling. Scratch resistant, They’ve used the highest quality plastics with shatter resistant polymer to make sure that it won’t take chunks out of your hoverboard when rolling around. Quiet, It operates in silence. If it didn’t move forward or keep you in balance you’d probably have to check it to know if it’s on. False Reviews, Many angry pre-hoverboard salesmen are leaving 1-star reviews with lies about their product. If I was to launch something I’d be very disappointed if someone just tried to throw dirt upon my brand. (Don’t give these reviews a second thought). Distance, Even though it has a moderate distance it is a bit on the downside. It is fast recharged so that kinda makes up for it. So the time has come! Not that it took them long to deliver the hovertrax, it took only 2 days. But we have been very anxious to see what the first Razor Hoverboard might have to offer. But even though they took their time on getting this scooter on to the market I don’t see any outer enhancements or improvements. It has almost the same basic design as the previous Gen 1 scooters. But it comes with one thing that no other self-balancing device has. The name Razor and everything that follows with that name. 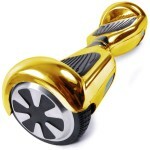 We recommend this hoverboard for kids mostly, you always want the safest device for your kids and since Razor has been making safe children’s products for quite some time their first kids self-balancing scooter should be the safest pick. So what can you expect to get from your Razor kid’s Hoverboard? Hovertrax is actually a really good first product. And as we know a product bearing the name Razor is a product to trust. With this hoverboard from Razor you’ll get their extensive warranty (don’t forget to request this, you can find a link on the product site), it is covered by their return policy, flawless and hassle free US support and one of the most important things, this hoverboard for girls is covered by patent laws. They bought the patent from one of the inventors in China. So we have been riding for about 2 hours and the battery is almost a 100% emptied, the battery is a Lithium ion Quick-Charge battery which allows for fast recharging. It took us about 1 hour to get this baby fully loaded again which is really fast. The battery is safe to use and has high-quality standards. Razor always deliver quality products to a good price. It has a top speed of 6 mph and it can go about 8 miles before the battery is completely empty. So the ride was smooth and definitely safe, in my opinion, they could have given this first version a bit more speed and greater distance. It is though a perfect kid’s hoverboard and it makes up for that not being able to start a bonfire. Always when getting a Razor product you instantly know what you get. Even though you haven’t tried it out on forehand you know you’ll be satisfied with the quality of your Razor purchase. And if not well, then you know you’ll have a trouble-free support and return. Getting to the end of our review, we can definitely see the Hovertrax being one of the better hoverboards for kids.